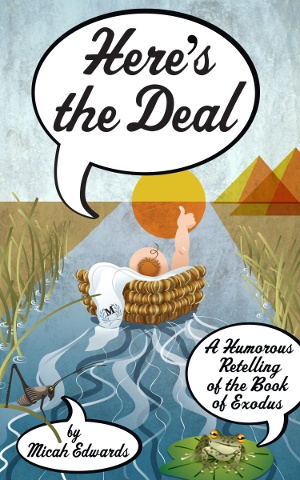 Here’s the Deal, Micah Edwards’ humorous retelling of the Book of Exodus, is out today! In Okay, So Look, Edwards had us laughing through the long list of begats in Genesis. Now he has us laugh through the tent decorating instructions in Exodus. Get your copy today! The paperback is just $9.99, and you can order it at Amazon, BN.com, or use IndieBound to find a local bookstore that can get it for you. You can also ask your local librarian to get the ebook, which is available via Overdrive and Baker and Taylor.